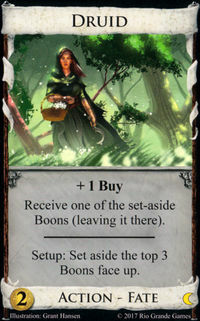 Note: There were 3 new cards added in the $0-$2 range from Renaissance. Yet again, we find Duchess at the bottom of the rankings, being ranked last on over half of the lists and over 4pp behind the next lowest card. 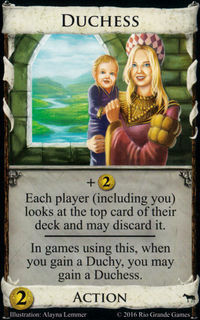 Perhaps out of pity, one list rated Duchess as the best card. You may sometimes pick one up for free when buying Duchy, but many times it's not worth even taking for free. Skipping over Duchess even when it's free points to the weakness of this card. Tax experienced one of the biggest drops on this year's list, falling four spots and being rated the worst card on five lists. With one of the lower standard deviations, there is substantial agreement amongst the voters. Like last year, Tax is also the lowest rated Event in the $0-$2 range. 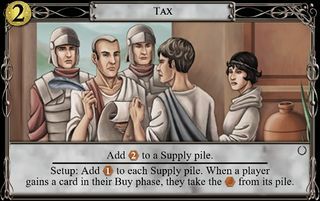 Unless you have a spare buy and $2 extra, Tax doesn't seem worth it and does little to alter the course of the game. Plus, you may be the one to eventually pick up the $2 Debt. Beggar rose one spot and saw a slight bump in it's overall rating. Beggar was voted lowest on two lists but also was rated the highest on one. Although adding three coppers can help hit early price points, adding the extra junk to your deck can really hurt future efficiency. You're typically trying to trash coppers, but there are certain edge cases where Beggar is quite useful. In particular, in games with sources of alt-VP like Gardens and Triumph, Beggar may have a substantial impact. 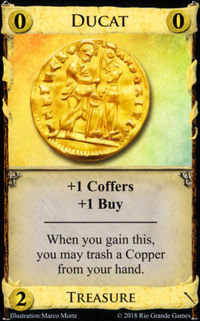 Additionally, the added coppers can be used as fuel for trash/discard for benefit cards. 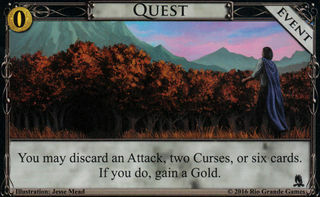 Quest is another Event that saw a significant drop in the rankings, falling three spots and 3.4pp. It was also ranked last by two voters. This Event offers alternate paths to gold, but reaching the conditions efficiently can be somewhat tricky. You probably don't want to base your opening buys off of this, but if the opportunity presents itself when your deck is filled with curses or you have lots of leftover cards from terminal draw, it can be worth the buy. Embargo gained two spots and saw a rating increase of 1.1pp. Despite the rating boost, Embargo was rated the lowest on three lists. With any sort of trashing in the Kingdom, the curse gained won't slow an opponent down too much. However, it may be useful on a 5/2 opening, where you can buy your $5 and place a token on it the second time through your deck. 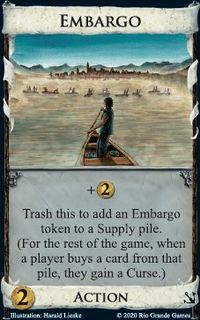 Also, as a terminal silver that leaves your deck, Embargo can help hit a key price point early but not clog up your deck later. Herbalist rose one spot but was also voted last once. Most of the time, you're buying Herbalist for the extra buy. In an engine deck, you won't want a treasure on top of your deck, instead wanting to draw it (and Herablist) later. Exceptions include top-decking a Potion to keep Alchemists alive or a Crown to kick off your next turn. Herbalist can be useful in money decks, allowing you to keep your best economy on top. Pearl Diver moved up three spots in the rankings. Despite two last place votes, it also saw the largest increase in its rating, adding 3.7pp. 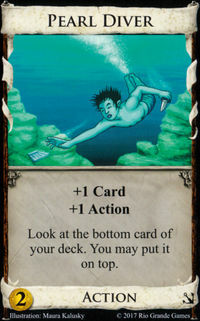 Pearl Diver won't clog your deck, but as a cantrip with marginal benefit, it won't make it significantly better either. While typically not very useful, topdecking your bottom card can sometimes keep a turn going and help ensure that a card doesn't miss a shuffle. Other marginal benefits include potential activation of Conspirator or lowering the cost of Peddler. Poor House maintained its ranking and dropped 1.9pp in rating. It is also the first card at the bottom that did not receive a last place vote. In games where you can trash most or all your treasures, Poor House offers pretty good payload at $4. This is even stronger in engine decks with spare actions. 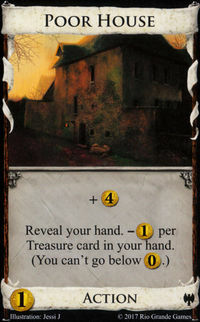 In Kingdoms with trashers that stipulate gaining cards costing exactly one coin more or less, Poor House can sneak up on you. Vagrant took a bit of a hit, falling two spots and losing 7.2pp. Vagrant often draws comparisons to Pearl Diver, but instead of interacting with the bottom of your deck, it lets you see the top card of your deck after drawing. 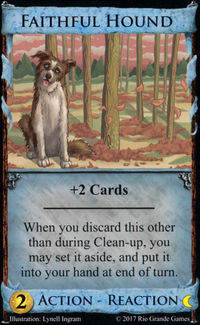 This helps sift through junk cards, but in clean decks, the marginal benefit just isn't that great. With the release of Renaissance, Vagrant can gain coffers if paired with Patron, but finding Patron would be quite lucky. Faithful Hound gained one in the rankings and saw a small rating increase of 0.1pp. Faithful Hound is very similar to the card that comes in just above it in the rankings: Moat. The two cards share the same cost and action but differ in their reaction. While the +2 cards offers some draw, it will only increase your hand size by one. Thus, using it in engines with non-drawing sources of actions does not do as much to keep you moving through your deck. The distinguishing feature in the Faithful Hound vs. Moat debate is the reaction effect. The benefit of Faithful Hound's reaction is that it increases your next hand to six cards, helping support discard for benefit action cards. One obvious example is with Artificer, where putting Hounds back in your deck the next turn increases the number available to discard. This reaction can also be helpful in decks using with sources of non-terminal draw such as Forum or Warehouse. Rather than using Faithful Hound for draw, it can be used fuel these other cards. Moat gained one spot despite seeing its rating drop by 0.9pp. As mentioned above, Moat and Faithful Hound are very similar cards with the only difference being their reaction effect. Thus, the use of Moat in engines is exactly the same as with Faithful Hound. While Moat protects against attacks, there is no guarantee that you will always have it in hand. Stacking your deck with Moats to prevent attacks clogs your deck and you're essentially attacking yourself. However, games with particularly harsh attacks can make Moat almost necessary. 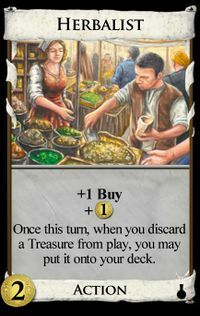 The availability of cards that allow you to topdeck your Moat without having to buy more than one or two can make it a more attractive purchase. Scheme and Star Chart offer this flexibility, although using Star Chart's ability on Moat is quite weak. Tracker was one of the biggest losers in this years ranking, falling five spots and 8.8pp. While Tracker is a terminal copper, it provides two benefits. The Boon you receive can help give you a leg up on your opponent, especially early in the game. However, the Boons are unreliable and at times can provide no benefit or even hurt you. Tracker also allows you to topdeck newly purchased cards. This can be particularly helpful in accelerating your deck, as you do not have to wait for a good card to work through the shuffle. While probably not the best terminal card out there, if your deck can support it, Tracker can be sneaky good. Tracker comes with Pouch, adding a source of +buy to your deck. While rising one spot in the rankings, Druid also saw a rating increase of 3.8pp. Unlike with Tracker, you know which Boons you're going to get when buying Druid. However, the randomness of which Boons are set aside makes assessing the strength of Druid as a whole difficult. With weaker Boons, Druid becomes almost obsolete. However, with a Boon like the The Field's Gift, Druid is no longer a terminal card, making it easier to work into your deck and giving a small economic boost. The Swamp's Gift adds some draw to your deck with Will-O-Wisps. While the Flame's Gift is appealing, it tends to be quite slow trashing. At the very least, Druid always gives +buy which can be helpful for adding components to your deck. Haven held its spot in the rankings but gained 1.1pp in rating. Haven isn't a powerhouse but can be helpful in improving the efficiency of your deck. 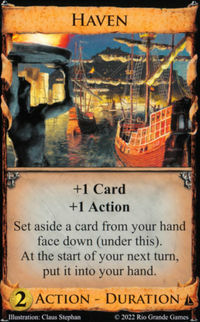 Being able to set aside stop cards such as Estates early or Provinces late keeps your deck moving along. A well-timed Haven can keep stop cards out of your shuffle. 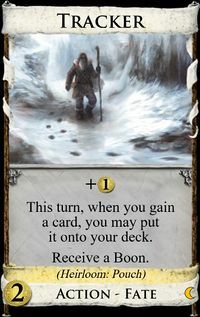 A pair of Havens or a single Haven and good deck tracking can be used to guarantee the connection of two cards such as Tournament/Province, two Treasure Maps, Village/Draw, etc. One drawback of Haven is that despite +1 card, it reduces your handsize. Cellar gained two spots in the ranking, increased its rating by 3.0pp and garnered one first place vote. Cellar is a good sifter that allows you cycle quickly through your deck. It can really shine in games with little or no trashing and lots of junking. One of the main issues with Cellar is that with each play, you actually reduce your hand size. Having too many in your deck without a source of draw can be an issue. 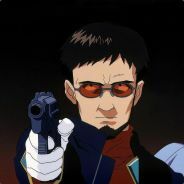 Settlers maintained its ranking and lost 0.7pp in rating. Settlers is the top card of a split pile with Bustling Village. When drawn towards the end of a shuffle and if you haven't trashed all your coppers, Settlers is at its best as a cheap Peddler. You can also set up this benefit in games with discard attacks or discarding actions. After discarding coppers, they can be picked back up with Settlers. The extra copper can help hit a key price point, especially early in the game. However, in games where you'll be trashing all of your starting coppers, it is rendered almost useless by the end of the game. Even at it's worst, Settlers should hardly ever make your deck worse. Pawn is two ranks higher and saw a rating increase of 2.2pp. While it doesn't have game changing abilities, Pawn won't really clog up your deck and offers good flexibility. As a non-terminal source of +buy, Pawn is quite useful in engine decks where you don't have to use it as draw. Using the extra coin early in the game can also help hit a key price point. Advance was the biggest loser yet again this year. Not only did it tie for the largest drop in ranking, five, it also lost the most rating, 11.7pp. Advance is very strong in two cases. 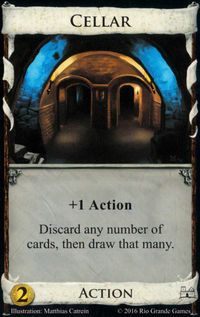 First, in games with Shelters, Advance can turn your Necropolis into a high-cost action card on turn 1 or 2. 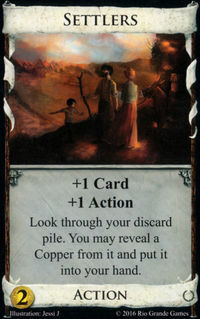 Second, trashing Ruins to Advance provides a very nice upgrade to otherwise useless cards. 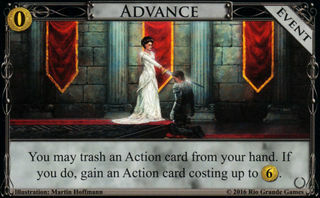 Other than those specific cases, Advance can be useful in games with extra sources of buy and cheap action cards that are good early but not as helpful later in the game. Ducat is the first card from Renaissance on this list and lowest rated of the three new $0-$2 cost cards. Ducat is very similar to Candlestick Maker, providing a source of non-terminal buy and a coffer, albeit in the buy phase. 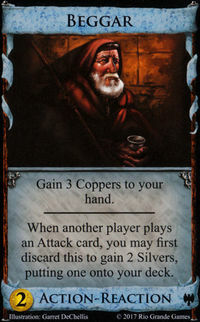 Be aware of the copper trashing ability, in that it must be a copper from your hand and not one in play. Even so, it is worth considering buying Ducat with $3 to exchange a copper with plus buy for a copper. Scouting Party kept its spot in the rankings and dropped 3.4pp in rating. At the very least, Scouting Party can really cycle your deck. In games with little or no trashing, you can skip over the junk and help line up two cards to kick off your next turn. In games with Travelers, Scouting Party can really accelerate the advancement up the line. Given that it comes with an additional buy, Scouting Party can be bought pain free if you have an extra $2 or $3 and don't want to pick up another action or Silver. 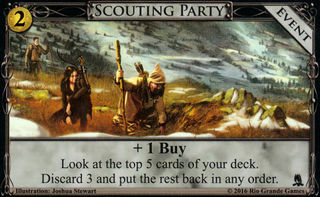 While there are times where Scouting Party can hurt you, forcing you to discard a card or two you would've liked to have held on to, it's still a useful card. Guardian lost one spot in the rankings and saw its rating drop by 4.8pp. There was a lot of disagreement on this card, with the second largest standard deviation in the bottom half of the list and one last place vote. Much like Lighthouse, Guardian protects against attacks, gives +$1 on your next turn, and serves as a dead card while in hand. Since Guardian is gained directly to your hand, it can serve as an advanced copper for your next draw, giving a slight boost to your next buy. In games with particularly strong attacks, setting up a deck with two Guardians that will allow you consistently play one per turn can be a game saver. In games with weaker attacks, it may be worth skipping Guardian altogether to avoid the dead card in hand. Candlestick Maker continued it's descent in the rankings, falling another four spots, along with a rating drop of 7.6pp. While Candlestick Maker is essentially an upgraded Pawn, providing an action, buy, and coffer, it's what's missing that limits its use. Without draw, Candlestick Maker is a stop card, albeit one that provides non-terminal buy. This makes it ideal for engine decks that can support it with other cards that draw. 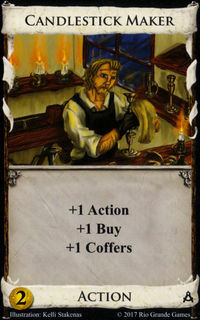 Candlestick Maker will add value to most decks, but having too many risks dud turns that only accumulate coffers. Of the cards in the bottom half, Patrician saw its ranking improve the most. It moved up four spots and gained 3.8pp in rating. 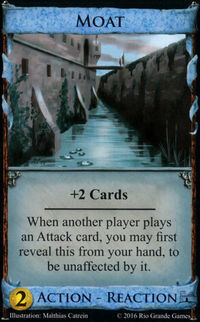 Patrician is the top card of a split pile with Emporium. In games with good trashing, Patrician can really shine, providing a good source of additional draw. 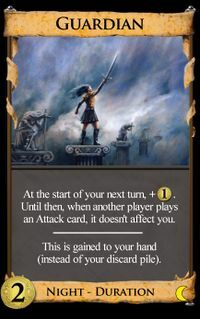 As many of the most impactful cards cost $5 or more, Patrician can be very strong. 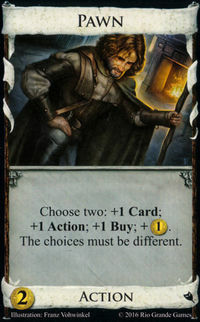 However, if you can't get rid of cheaper cards, Patrician's ability to draw extra cards is diminished. Thus, the strength tends to be board specific. If nothing else, Patrician can serve as a Vagrant later in the game, drawing in Duchies and Provinces, allowing for cleaner hands down the road. Delve fell four spots and lost 5.2pp in rating. There was a fair amount of disagreement, with Delve having the third highest standard deviation in the bottom half and one last place vote. Delve is tied to how useful having Silver in your deck is. 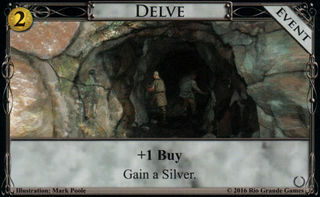 In games with Feodum or Triumph, Delve can be quite impactful. An early Delve can help hit $5 the second time through your deck, or on boards with no good $2 options, Delve provides an alternative over nothing. Many thanks to Qvist for setting this up yet again and apologies in advance for any mistakes or disagreements. If you find anything wrong or glaring omissions, let me know and I'll take care of it. Ducat below CSM is pretty surprising to me. It's almost strictly better. This. Are people really using Throne Room that much? Good to see Advance and Delve dropping. 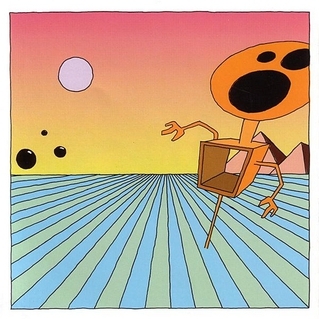 I think Haven and Cellar are still underrated. I still think Haven is overrated. Draw-to-X decks make CSM outshine Ducat pretty severely, and are even more common now with the addition of Cursed Village and Scholar in the last two expansions. 47: Tax (41) - This event is tricky to rate, but... worse than Beggar, Embargo, and Herbalist? No way. The winner buys Tax at least once in 59% of games - and an average of 1.4 times across all games. Some of these buys aren't impactful, but I can attest that some certainly are. 37: Tracker (31) - I don't know why this card lost ranks; it's solid. Topdecking gains and buys is a powerful effect. If you can spare the terminal space, you should get one. It's gained by the winner in 51% of games. 31: Advance (21) - This is the biggest mistake of the list, IMO. In addition to the Shelter and Ruins cases that alibby1152 mentioned, Advance is going to be part of the best build whenever plentiful +buy and cheap action cards are available. This card can give you a completely different way to build your deck. Advance is bought by the winner in 66% of games with an average quantity of 1.9 buys - both significantly higher than the loser. This is a high-skill card that speeds up games; don't sleep on it! 28: Guardian (22) - If the opponent has an attack more significant than Scrying Pool, it almost always pays to have Guardian defense. It's gained by the winner in only 56% of games and seems to be overgained, so I can believe that I ranked it a little too high. 26: Patrician (33) - I like Patrician a lot. But, I guess there are more $2 cards I like more? It's hard to compare it with the non-cantrips, my only deviation from the community consensus on that front is Haven > Patrician, but they're close. I made my list, but never submitted it. Now, I wish I had. Guardian is better than Lighthouse. It just is. I'm not surprised by Ducat. I have CM rated higher than it. Tracker seems underrated. I'm not sure where I rated Delve, but it might be underrated. CSM can also be Throned to produce duplicate Actions, found with Scrying Pool, played off Imp or Conclave, etc. The on gain trash of Ducat is less useless than I thought, though newer players still overuse it and justify skipping good $3s or even $4s to do it. Glad to see meaningful comments again with the rankings! 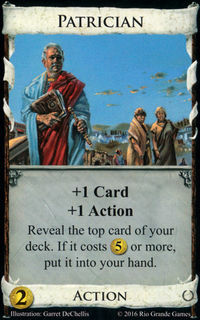 Pearl Diver (or any other Cantrips) not only increases number of Action played for Peddler and Conspirator, he also increases variety for Horn of Plenty, Masquerade, Imp and Conclave, and is an emergency target for Throne Room and King's Court, not to forget for Herald. Advance also shines with Squire if there's a more powerful Attack in the Kingdom. This idea of Ducat being playable if drawn with a terminal action, well Ducat is pretty low impact to make up for potentially dead drawn actions. How often do you want to risk dead drawing stuff in the first place? Candlestick Maker also works with a lot of Landmarks, and it feels like there are a bunch of cards that benefit from CSM being an action compared to Ducat. But, Ducat has its own synergies. Someone made a list comparing the benefits of CSM's Action type vs. Ducat's Treasure type. I don't know where that list is though. Instead of comparing Ducat to Candlestick Maker, we should really be comparing it to Market Square. Isn't that like comparing Gold to Smithy? How does that work? Well, if you buy it and trash a copper, ducat is like a nonterminal +buy that doesn't take up space in your deck for $3. Market square is also like that. I feel like this only works if the card you draw when you play Market Square is a Copper. 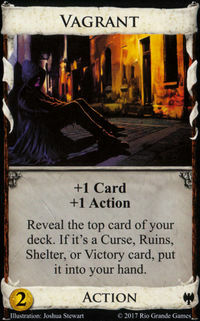 If by some fluke of the shuffle, Market Square always appeared immediately before one of the coppers in your deck, would that make a huge difference in its power level? The Ducat/Market Square comparison is basically identical to the comparison people make between thinning a card, and gaining a lab. There are a few disanalogies, for example if you thin a copper you no longer get the value from the copper every shuffle (which makes it more like gaining a Fugitive than a Lab). And while you can't thin more coppers than you had to begin with, you can gain more labs. Of course, a nontrivial amount of Market Square's power comes from the reaction. Ducat's extra effect on top of the +buy is like a poor man's Pageant. The same goes for Embargo. I like that it gives me $2 then gets out of the way. I don't care much for the Cursing bit but I like that it self trashes. Great for many $5 $2 openings. But you can buy Ducat for $2. It's not like no one buys CSM for $2. Agreed. Tax and Embargo often don't make much difference, but they're like Pearl Diver in that they sometimes help and usually don't hurt. At the very least, I put them above Beggar and Herbalist which usually do hurt. I don't understand why Tracker is so low. Topdecking the card you just bought is actually a pretty strong effect in the early game. Royal Seal is only bad because it costs $5. Check out my fan expansion, Dominion: Resurgence. I have a list of other people's fan-made cards that I've tested and like here. Embargo definitely does hurt at times. There are 5/2s where I don't think I'd buy Embargo on the $2. One thing worth noting is that by buying Embargo, you're actually almost doubling the chance your $5 misses the shuffle. If you open $5/nothing, your $5 is the final card 1/11 of the time, about 9%. If you open $5/Embargo, your $5 is one of the final 2 cards 2/12 of the time, about 16.6% of the time. The +$2 from Embargo offsets this but it's not an obvious tradeoff to make. The big thing that changed my mind about Tax was looking at the markus stats plots and finding that it actually adds no 1st-player or 2nd-player advantage, it's completely neutral, despite adding all the Debt at setup time. It's not really that buying Tax is bad, it's more that it's not really that good either. Re why is Tracker so low: topdecking cards is quite strong. Having to buy a terminal Copper + random Boon to do so isn't that strong. Part of the problem with Tracker is that it comes with Pouch, so you have a +Buy card for free, which pushes you towards an engine, which would often rather spend its terminal space on something other than Tracker. Tax is like spending $2 and a buy now to make the opponent spend $2 later, in a way they can control to some extent. Not a great trade-off. At least Embargo's attack is stronger than the price you pay for it. Granted if you have spare money and buy it's worth it, but still not a huge gain. And you have to guess what card the opponent will want, which cannot be a card that you want. And if you change your mind later, you are the one paying the debt. People are comparing it to Pearl Diver but PD is pretty low, and doesn't have a chance of backfiring like Tax does. Tax is like spending $2 and a buy now to make the opponent spend $2 later, in a way they can control to some extent. Not a great trade-off. Yes, but it's better than buying nothing.